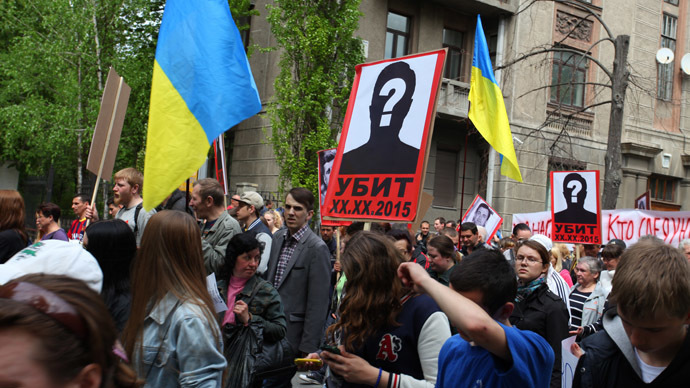 March to honor the victims of the Odessa massacre in Ukrainian capital Kiev on May 2, 2015. Thousands of people in Ukraine, Russia and around the world took to the streets to mark the first anniversary of the Odessa massacre. Last year, 48 activists were killed and over 200 injured as radicals set the local trade unions house on fire. The commemoration ceremonies for those who died in the fire on May 2, 2014 proceeded without serious incident in the Ukrainian port city of Odessa. A huge crowd, including the relatives of the victims, gathered in front of the Trade Unions building and released black balloons and doves in air. According to local media, the rally in Odessa was attended by around 5,000 people. The people held banners reading “fascism won’t pass” and “no to political repressions,” with some carrying photos of journalist Oles Buzina and politician Oleg Kalashnikov, who were assassinated in Kiev last month. The people were carrying photos of those who died in the fire, as well as pictures of Buzina and Kalashnikov. Several arrests were made during the demonstration, with the Kiev police saying that they “invited the men to a local police station”. They were later released. Earlier, reports emerged on social media that it was the organizers of the rally, who had been detained by the security officials. “The organizers of a peaceful rally have been arrested in Kiev! What for? Show me a single slogan, for which you can be arrested in a democratic ‘European’ country?” Yuri Kot, Ukrainian public figure and journalist, wrote on Facebook. In Moscow, around 1,000 people gathered in front of the Ukrainian Embassy to Russia to commemorate the Odessa massacre victims. An outdoor photo exhibition, showcasing pictures of the burning Odessa Trade Union House, was organized together with the rally. “It was very hard to not to cry. I didn’t expect so many people to care and feel for the sorrow,” an eastern Ukrainian resident, who attended the event, told RIA-Novosti. At the end, the bell tolled 48 times to commemorate each victim of the last year’s tragedy. Remembrance events were also held in Australia, Poland, the Republic of Ireland, Switzerland, Morocco and other countries. In Italy, a monument to the Odessa tragedy was opened in the northern town of Ceriano Laghetto. Ukraine authorities deployed over 3,000 law enforcers in Odessa ahead of the anniversary of mass killings on May 2. Odessa's Kulikovo Field, the square where the bloodiest scenes in the last year’s confrontation unfolded, was cordoned off on Friday. People wishing to lay flowers in front of the Trade Unions building, where dozens of activists met their deaths, have had to pass through metal detectors. The streets are being patrolled by some 2,600 police officers, while 600 special service fighters are on alert, the Interior Ministry reported. Unarmed volunteer activists were also called to Odessa. “There cannot be too much police presence. It's a demonstration of our presence and strength to those who want to shake the situation in Odessa. There will be a policeman in every square meter,” Ivan Katerhinchuk, the chief of Odessa region's police force, told the media. Earlier on Friday, police troops brought in from other regions and their local colleagues gathered in front of the building. CCTV footage showed dozens of trucks and patrol cars parked in rows and columns of security forces marching in the streets. Ukraine's national security agency, the SBU, reported arresting dozens of people suspected of “separatist activities” in Odessa in April. On Friday, it reported busting a “separatist ring” consisting of “former police and SBU officers, members of pro-Russian political parties, Kulikovo field activists and criminals.” The agency said it had arrested 20 ringleaders. Those who lost loved ones in Odessa say they are fearful of being involved in politics. “I don't go to rallies. It's personal. My brother died and my father died. As for what and how it happened and what political forces were involved, we don't get into it. Our families' safety is what important for us,” one of them Aleksandr Neogarov told RT. On May 2, 2014 an estimated 2,000 pro-Kiev activists, many of them radical football fans, marched the streets of Odessa in support of the post-coup government. They clashed with anti-government activists, who were demanding the Odessa region renounce Kiev and get greater autonomy from central government. Running street battles ensued with pro-government fighters sending their opponents on the run. The clashes escalated when the radicals raided a tent camp in the Kulikovo Field, where hundreds of peaceful protesters had been holding a sit-in for weeks. The camp was torched with Molotov cocktails and its occupants took refuge in the Trade Union building. However, the building itself was set on fire and a baying crowd surrounded it. Dozens of people died from smoke poisoning or from falling when they tried to escape the fire. Some of those who managed to flee were rounded up and beaten up by the radicals. “We saw people jumping out of the windows into the backyard. People were running to them and hitting them on their heads,” Igor Nemodruk, a survivor, told RT. According to the official report, 48 people died, including 6 pro-government activists and 42 anti-government activists. More than 200 were injured. Some say the report underestimated the number of casualties, with estimated fatality counts reaching as high as 116. Twenty-two people are being prosecuted in connection with the tragedy. Half of these are still on the run. The investigators say police negligence is to blame and reject evidence that Odessa law enforcers were actually involved in orchestrating the crackdown on the opposition camp. Moscow accuses the Ukrainian government of failing to investigate last year's tragedy properly. Russia says foreign sponsors of the new government in Kiev are not doing enough to pressurize Ukraine to ensure that those responsible face justice. The building itself may soon be converted into the Ukrainian Navy's HQ or a military hospital, Odessa Governor Igor Palitsa said on Saturday.